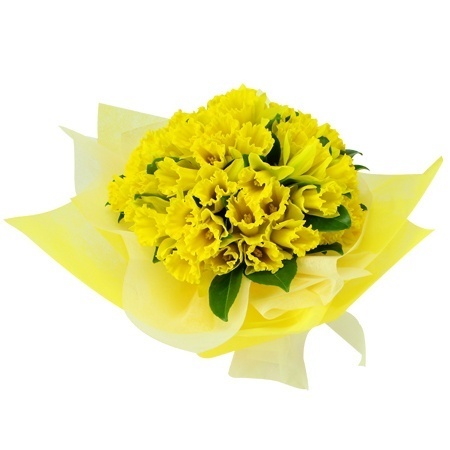 Flowers for Everyone hand select only the freshest Daffodils for this new delightful posy. We buy our flowers directly from local growers and carefully craft each posy to deliver only the freshest longest lasting Daffodils to you. Freshness is guaranteed each and every time. 2016-09-03 Delivered same day. Online order simple. Confirmation emails. Couldn`t ask for more. Thx. 2016-03-12 Service rating : The lady I spoke to was lovely. The only reason I cancelled my order was due to additional delivery fees from the florist in Perth. This would have made the delivery as expensive, if not more than the actual bouquet. Product : I was advised that daffodils weren`t in season. So a different bouquet with similar colours was offered to substitute. 2015-08-26 Service rating : Service was excellent!!! Easy, straight forward Internet order, great communication (even confirmation of delivery!!) and product was of an exceptional standard!! Accurate to description, timely delivery, professional and I completely recommend!!! Wish your service was worldwide!!!! Product : Gorgeous!! High quality flowers and generous sized bunch!